The Lockheed MC-130 is the basic designation for a family of special mission aircraft operated by the United States Air Force Special Operations Command (AFSOC), a wing of the Air Education and Training Command, and an AFSOC-gained wing of the Air Force Reserve Command. Based on the C-130 Hercules transport, their mission is the infiltration, exfiltration, and resupply of special operations forces, and the air refueling of (primarily) special operations helicopter and tilt-rotor aircraft. Members of the family include the MC-130E Combat Talon I, MC-130H Combat Talon II, MC-130W Combat/Dragon Spear, MC-130P Combat Shadow, and MC-130J Commando II. A possible MC-130 variant, designated the XFC-130H, did not proceed beyond the development stage, but one of its aircraft became the YMC-130H test bed aircraft for the Combat Talon II. The Air Force is requesting acquisition of at least 37 new production MC-130J aircraft to replace the Combat Talon Is and Combat Shadows, with the first ten received in 2011. A total of 69 MC-130J aircraft are planned, which will eventually replace all other MC-130 variants. The MC-130E was the first Combat Talon and was developed to support clandestine special operations missions during the Vietnam War. Eighteen were created by modifying C-130E transports, and four lost through attrition, but the remainder continue in service more than four decades after their initial modification. An updated Combat Talon II was developed in the 1980s from the C-130H variant of the Hercules and went into service in the 1990s. Four of its 24 original aircraft have been lost in operations. The Combat Spear was implemented in 2006 as a cost effective program to supplement the Combat Talon II force, based on the same airframe. The Combat Shadow is a redesignation of several HC-130s. Initially developed during the Vietnam War for search and rescue operations, 28 were diverted to AFSOC in the 1980s to provide it with organic air refueling assets. The Combat Talon was initially developed between December 1964 and January 1967 by Lockheed Air Services (LAS) at Ontario, California, as the result of a study by Big Safari, the USAF's program office responsible for modification and sustainment of special mission aircraft. From it two highly classified test bed aircraft (originally serial no. 64-0506 and -0507, but with all numbers "sanitized" from the aircraft), were assigned to Project Thin Slice to develop a low level clandestine penetration aircraft suitable for Special Forces operations in Southeast Asia. In 1964 Lockheed had modified six C-123B Providers for "unconventional warfare" under Project Duck Hook and then been tasked with adapting the C-130E when the Duck Hook aircraft proved inadequate for the newly launched MACV-SOG. The modifications under Thin Slice and its August 1966 successor Heavy Chain were code named Rivet Yard, and the four C-130Es came to be known as "Yards". Discrete modification tests were conducted by the 1198th Operational Evaluation and Training Squadron, out of Area II of Norton AFB at San Bernardino, California, 30 miles east of Ontario. As the Thin Slice aircraft were being developed, SOG requirements resulted in the procurement of 14 C-130Es in 1965 for similar modification. The first aircraft were production C-130Es without specialized equipment that were produced at Lockheed's facility in Marietta, Georgia. Production airplanes were modified with the installation of the Fulton STARS (then ARS) system, at the rate of three aircraft per month. While awaiting installation of the ARS equipment, the C-130s were ferried to Greenville, South Carolina, for painting by Ling-Temco-Vought Electrosystems with a low-radar reflective paint that added 370 pounds to their weight. The velvet black and green scheme resulted in the aircraft being nicknamed "Blackbirds". As installation was completed, the Blackbirds were returned to Ontario for installation of the electronics package, code-named Rivet Clamp. The aircraft modified became known as "Clamps" (two of the original 14, 64-0564 and -0565, were diverted to Heavy Chain in August 1966). The aircraft collectively were assigned the designation Combat Talon in 1967. The Fulton Surface-To-Air Recovery System was used to extract personnel and materials via air. A large helium balloon raised a nylon lift line into the air, which was snagged by a large scissors-shaped yoke attached to the nose of the plane. The yoke snagged the line and released the balloon, yanking the attached cargo off the ground with a shock less than that of an opening parachute. A sky anchor secured the line and wires stretched from the nose to both leading wing tip edges protected the propellers from the line on missed snag attempts. Crew members hooked the snagged line as it trailed behind and attached it to the hydraulic winch, pulling the attached person or cargo into the plane through the rear cargo door. Following a fatality on 26 April 1982, at CFB Lahr, Germany, the Fulton STARS system on the Clamp aircraft underwent intense maintenance scrutiny and employment of the system for live pickups was suspended. A major effort at upgrading the system, Project 46, was pursued from 1986 to 1989, but at its conclusion, use of the STARS system for live extractions remained suspended. The Fulton STARS equipment of all Combat Talons was removed during 1998. Rivet Clamp installation began with four STARS-equipped C-130s completed by March 1966, followed by installations in eight further aircraft in July 1966 and January 1967. The Rivet Clamps, originally designated C-130E(I), were equipped with an electronic and infrared (IR) countermeasures suite; and the AN/APQ-115 navigational radar. This radar, adapted from the Texas Instruments AN/APQ-89 radar used in the RF-4C Phantom photo reconnaissance aircraft, featured terrain following/terrain-avoidance (TF/TA), Doppler, and mapping radar modes, to enable it to operate at low altitudes at night and in all weather conditions and avoid known enemy radar and anti-aircraft weapons concentrations. Beginning in 1970, Texas Instruments and Lockheed Air Service worked to adapt the existing AN/APQ-122 Adverse Weather Aerial Delivery System (AWADS) with terrain following/terrain avoidance modes to replace the original APQ-115, which suffered throughout its life with an unacceptably adverse mean-time-between-failure (MTBF) rate. In 1970 they succeeded, and coupled the APQ-122 with the Litton LN-15J Inertial Navigation System (INS). Known as MOD-70, the modified radar was installed in all 12 operational Combat Talons and the four Heavy Chain test beds between 1971-1973. The system proved so successful that it continued in service until the late 1980s. Following the completion of MOD-70, the Combat Talons were divided into three designations: C-130E(CT) for the "Clamp" aircraft, C-130E(Y) for the "Yank" (formerly "Yard") Talons, and C-130E(S) for the "Swap". The Combat Talon I designations were consolidated in 1977 as the MC-130 and have remained under that designation since. The Combat Talon became the Combat Talon I in 1984 with the authorization for the modification of 24 C-130Hs to Combat Talon II specifications. Capability to act as a Forward Area Refueling Point (FARP) for helicopters on the ground was begun in 1980 in preparation for Operation Eagle Claw (see below), although only one system could be installed before the mission was executed. The refueling system consists of two palletized 1,800 gallon tanks (known as Benson tanks) mounted on rails within the Talon that tie into the C-130's own pressurized fuel dumping pumps and require no further equipment. A major modification between 1986 and 1994, MOD-90, modernized the capability and serviceability of the Talon I to extend its service life. All 14 Combat Talon Is with upgraded navigational radars, an enhanced electronic warfare suite and provided new outer wings. By 1995 all Combat Talon Is were equipped with a helicopter-air refueling pods. The aircraft received for modification as Combat Talons were assigned in July 1965 to the 464th Troop Carrier Wing at Pope Air Force Base, North Carolina. Because of a lack of ramp space caused by the buildup of forces for deployment to South Vietnam, they were temporarily housed at Sewart Air Force Base, Tennessee. The wing's 779th TCS was designated as the training squadron for the modified C-130E(I)s, under Project Skyhook, in addition to its normal airlift function. Selected crew members received instructor training in their respective systems and returned to Pope by May 1 to begin crew training of six crews for deployment to Vietnam under Project Stray Goose. The Combat Talon I first saw operational action in the Vietnam War, beginning September 1, 1966. The six Stray Goose crews deployed to Ching Chuan Kang Air Base, Taiwan, and forward deployed to Nha Trang Air Base, South Vietnam. The deployment, known as Combat Spear, preceded operational deployment of other Combat Talons to Europe (Combat Arrow) and the United States (Combat Knife). Combat Spear was administratively assigned as Detachment 1, 314th Troop Carrier Wing, but was operationally controlled by MACV-SOG. On October 9, 2009, Detachment 1, 314th Troop Carrier Wing received the Presidential Unit Citation for its support of MACV-SOG activities. Chief of Staff of the Air Force General Norton A. Schwartz presented the award to the unit during a ceremony at Hurlburt Field, culminating a six-year campaign by former Stray Goose member Richard H. Sell to achieve the recognition after the unit was not included in a PUC awarded April 4, 2001, to MACV-SOG for the same period. 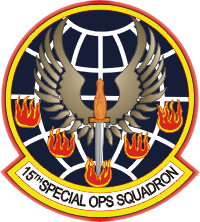 On March 15, 1968, the detachment was designated the 15th Air Commando Squadron, and then the 15th Special Operations Squadron on August 1, 1968, and made part of the 14th Special Operations Wing. In Vietnam, the aircraft was used to drop leaflets over North Vietnamese positions, and to insert and resupply special forces and indigenous units into hostile territory throughout Southeast Asia. Combat Talon crews operated unescorted at low altitudes and at night. Detachment 2, 1st Special Operations Wing, Pope Air Force Base, North Carolina, (redesignated 318th SOS in 1971 and 8th SOS in 1974). The 15th SOS was redesignated the 90th SOS on October 23, 1970, relocated to Cam Ranh Bay Air Base, then moved to Kadena Air Base, Okinawa, in April 1972 as part of the drawdown of U.S. forces in Vietnam. It was again redesignated, becoming the 1st SOS on December 15, 1972, and began transition from the "Clamp" to the "Yank" variant. Mixed formation of helicopters and Combat Talon of the Son Tay rescue operation during a practice mission. Two Combat Talons were employed as navigation escorts and for airborne control during Operation Kingpin, the operational phase of the attempted rescue of prisoners of war from Son Tay prison camp in North Vietnam on November 21, 1970. 64-0523 was drawn from the 15th SOS at Nha Trang and 64-0558 from Det. 2, 1st SOW at Pope AFB. The aircraft were modified at LAS Ontario with installation of FL-2B FLIR sets borrowed from the Heavy Chain project to compensate for difficulties in terrain-following created by the slow speeds necessitated by the mixed aircraft force. 24 primary and five backup crew personnel, all Stray Goose/Combat Spear veterans detached from 7th SOS (Combat Arrow) and 1st SOW (Combat Knife), developed helicopter-fixed wing formation procedures for low level night missions and jointly trained with selected Special Forces volunteers at Eglin Air Force Base, Florida. Between the end of August and September 28, 1970, Talon, helicopter, and A-1 Skyraider crews supervised by Combat Talon Program Manager Lt. Col. Benjamin N. Kraljev rehearsed the flight profile in terrain-following missions over southern Alabama, flying 368 sorties that totalled more than 1,000 hours. A month of intensive joint training with the Special Forces rescue force followed at a replica of the prison camp. In early November the task force deployed to Takhli Royal Thai Air Force Base, Thailand. The 24 primary crew members, a 7th SOS crew (Cherry 01) under Major Irl L. "Leon" Franklin and a 1st SOW crew (Cherry 02) commanded by Lt Col Albert P. "Friday" Blosch, conducted the mission, which was successfully executed without loss of any personnel. However the operation failed when the prison was found not to contain any prisoners. In 1974 the Combat Talon program was nearly dismantled as the Air Force sought to reverse its Vietnam emphasis on special operations. The 1st Special Operations Wing was redesignated the 834th Tactical Composite Wing and its Combat Talons of the 8th SOS became a TAC asset. However the use of 1st SOS "Yank" Talons in a sea surveillance role off North Korea in 1975 revived interest in the Combat Talon, as did the Israeli hostage rescue at Entebbe Airport. The same year, an MC-130 of the 1st Special Operations Wing was deployed in support of US Marines forces on Koh Tang island during the Mayaguez incident, dropping a single BLU-82 15,000 lb bomb to enable their extraction. However, as late as 1978-1979, Air Force Special Operations Forces was still disregarded by many staff planners, who saw it as a drain on resources and not a force enabler, and wanted the entire Talon fore transferred to the Air National Guard. 8th Special Operations Squadron, Hurlburt Field, Florida - (six MC-130 Clamps). Following the seizure of the U.S. embassy in Tehran, Iran, on November 4, 1979, training operations for a rescue mission of the 53 hostages began as early as November 7 by Talon crews at Kadena AB, and November 26 by crews at Hurlburt. At that time only seven Combat Talons had the in-flight refueling capability necessary for the mission, which was to be mounted out of either Egypt or Diego Garcia (Masirah Island did not become available as a base until April 1980). All were assigned to the operation, a complex two-night plan called Eagle Claw. Talon crews using night vision goggles practiced blacked-out landings to insert Delta Force operators and U.S. Army Rangers deep into Iran, and developed several methods for delivering extra fuel for the RH-53D Sea Stallion helicopters chosen to carry out the rescued hostages. Four transcontinental, all-component, two-night rehearsals were held between December 1979 and March 1980, including a full-scale rehearsal March 25–26 that involved every element of the final plan except the EC-130s. The four Talons (including a spare) of the 1st SOS staged to Masirah Island off the coast of Oman on April 19, 1980, to lead the Night One infiltration phase, while the three of the 8th SOS deployed to Wadi Qena, Egypt, on April 21 to lead the Night Two exfiltration phase. To establish a "normal" C-130 presence in Egypt, Talons of the 7th SOS (none of which had aerial refueling capability) conducted regular flights using Military Airlift Command call signs in and out of Wadi Qena between January 2 and April 8, 1980. They also used the deception to discreetly pre-position needed equipment, including ammunition for AC-130 gunships, at the staging base. The Talon crews also manned three borrowed EC-130E ABCCC aircraft configured to carry 18,000 U.S. gallons of jet fuel in six collapsible bladders for refueling the helicopters. After returning to Masirah, three of the 8th SOS Night One crews would be flown to Wadi Qena to carry out the Night Two mission. The first phase of the rescue mission began the evening of April 24, led by Lt Col Robert L. Brenci of the 8th SOS in Talon 64-0565, Dragon 1. The 1st SOS Talons successfully secured the forward operating location ("Desert One") in the Iranian Desert, but the helicopter portion of the mission ended in disaster. 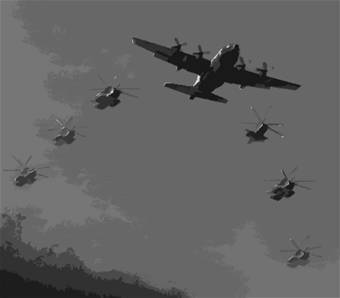 Although the mission was an embarrassing failure costing eight lives, seven helicopters, and an EC-130E aircraft in a ground accident, the MC-130s performed nearly flawlessly. Planning initiatives for a second rescue attempt, under the project name Honey Badger, began two weeks after the failed raid and continued through November. Combat Talon participation in Honey Badger amounted largely to tactics development, but ECM improvements included chaff and flare dispensers and new ALR-69 threat receivers that improved its defensive countermeasures capability well beyond that existing prior to Eagle Claw. Five Combat Talons of the 8th Special Operations Squadron participated in Operation Urgent Fury, the United States invasion of Grenada between October 25 and 31, 1983. Unlike previous operations that involved months of planning, training, and reconnaissance, the 8th SOS prepared in less than 72 hours after being alerted. Its assignment was to airland a battalion of the 1st Ranger Battalion at night to capture Point Salines International Airport, defended by both Cuban and Grenadan troops, in the opening moments of the operation. The five Talons divided into three elements, two of them leading formations of Special Operations Low Level-equipped (SOLL) C-130 transports. In clouds at 500 ft (150 m) above the sea and 20 mi (32 km) west of its objective, the lead Talon (64-0562) experienced a complete failure of its APQ-122 radar. Reorganization of the mission formations delayed the airlanding for 30 minutes, during which U.S. Marines made their amphibious landing. To compound the lack of surprise, the U.S. Department of State, apparently in a good faith but inept diplomatic gesture, contacted Cuban authorities and compromised the mission, further alerting the defenses, including a dozen ZU-23-2 antiaircraft guns. An AC-130 Spectre gunship, directed to observe the main runway for obstructions, reported it blocked by construction equipment and barricades. Loadmasters aboard the inbound Combat Talons reconfigured them for a parachute drop in less than thirty minutes. Talon 64-0568, flown as Foxtrot 35 by 8th SOS commander Lt Col (later Maj Gen) James L. Hobson and with the commander of the Twenty-Third Air Force, Maj Gen William J. Mall, Jr., aboard as a passenger, combat-dropped the headquarters section of the 1st Ranger Battalion on the airport, despite being targeted by a searchlight and under heavy AAA fire. Two Spectre gunships suppressed the AAA so that the other Combat Talons and the SOLL C-130s could complete the parachute drop of the Ranger battalion, with the only damage to the Talons being three hits by small arms fire to 64-0572. For his actions, Hobson was awarded the MacKay Trophy in 1984. Talons supported Operation Just Cause, the United States invasion of Panama in December 1989 and January 1990. Three MC-130Es of the 1st Special Operations Wing deployed to Hunter Army Air Field, Georgia within 48 hours of being alerted, then airlanded Rangers of the 2nd Battalion 75th Ranger Regiment into Rio Hato Military Airfield on December 18, 1989. The operation was conducted under total blackout conditions, using night vision goggles, 35 minutes after the opening parachute assault. One of the MC-130s had an engine disabled by a ground obstruction while taxiing, then made an NVG takeoff on three engines under intense ground fire, earning its pilot the Distinguished Flying Cross. The lead Talon, the only MC-130E equipped with the Benson tank refueling system, remained on the airfield as a Forward Area Refueling and Rearming Point (FARRP) for U.S. Army OH-6 helicopters. When Panamanian General Manuel Noriega surrendered on January 3, he was immediately flown to Homestead Air Force Base, Florida, by a Combat Talon. The 1991 invasion of Kuwait by Iraq resulted in the deployment of four Combat Talons and six crews of the 8th SOS in August 1990 to King Fahd International Airport in Saudi Arabia as a component of Operation Desert Shield. During Operation Desert Storm, the combat phase of the Gulf War in January and February 1991, the Combat Talon performed one-third of all airdrops during the campaign, and participated in psychological operations, flying 15 leaflet-drop missions before and throughout the war. Combat Talon crews also conducted five BLU-82B "Daisy Cutter" missions during the two weeks preceding the onset of the ground campaign, dropping 11 bombs on Iraqi positions at night from altitudes between 16,000 ft (4,900 m) and 21,000 ft (6,400 m), once in concert with a bombardment by the battleship USS Wisconsin. 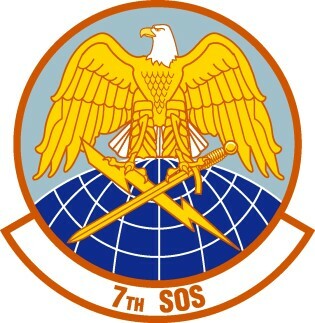 Two 7th SOS Talons deployed to Incirlik Air Base, Turkey, as part of Operation Proven Force. They supported the first Joint Search and Rescue mission over Iraq, attempting to recover the crew of Corvette 03, a downed F-15E Strike Eagle. However permission from the Turkish government to fly the mission was delayed for 24 hours, and the crew was not recovered. On October 6, 1995, the Air Force began shifting the Combat Talon I force to the Air Force Reserve Command's 711th Special Operations Squadron based at Duke Field (Eglin AFB Auxiliary Field #3), Florida, with the transfer of MC-130E 64-0571. Six went to the 711th SOS over the next year for crew training, and the squadron became operational on March 1, 1997. On March 5, 1999, the 8th Special Operations Squadron became the first active force squadron to become an Associate Unit to an Air Reserve Component organization, co-located with the 711th SOS, but without aircraft of its own, flying those of the reserve unit. Ten of the Combat Talon Is were primary assigned aircraft (PAA), two were assigned to crew training, and two were placed in backup inventory aircraft (BIA) storage. A Combat Talon I was the first aircraft to land at New Orleans International Airport after Hurricane Katrina in August 2005. On July 14, 2006, the 8th SOS flew its last Combat Talon I mission and began conversion to the CV-22 Osprey, ending 41 years of active service for the MC-130E Combat Talon I. Although retired from the Regular Air Force, the MC-130E continued to remain in service with the Air Force Reserve Command's 919th Special Operations Wing. The MC-130E Combat Talon I has been replaced by the MC-130J Commando II, which has the capability to complete missions faster and more efficiently than its MC-130H Combat Talon II and MC-130P Combat Shadow counterparts. Recapitalization is a stated priority of Lt Gen Donald C. Wurster, commander of Air Force Special Operations Command. Only eight MC-130E aircraft were still active in 2009, and four in 2013. On 15 April 2013, the four MC-130Es took off on their final mission. The MC-130E Combat Talon I was finally retired on 25 April 2013 in ceremonies at Duke Field. Three of the aircraft were then flown to the 309th Aerospace Maintenance and Regeneration Group at Davis-Monthan AFB, Arizona, while the fourth aircraft, AF Ser. No. 64-0523 (nicknamed "Godfather") was flown to Cannon AFB, New Mexico on June 22, 2012, for eventual display at that base's airpark. The retirement date marked the 33rd anniversary of the Desert One, the mission to free American hostages in Iran, of which several MC-130Es were a part. One of the measures considered for a second hostage rescue attempt in Iran was a project to develop a "Super STOL" aircraft, to be flown by Combat Talon crews, that would use a soccer stadium near the US Embassy as an improvised landing field. Called Credible Sport, the project acquired three C-130H transports from an airlift unit in late August 1980, one as a test bed and two for the mission, and modified them on an accelerated basis. Designated as the XFC-130H, the aircraft were modified by the installation of 30 rockets in five sets: eight firing forward to stop the aircraft, eight downward to brake its descent rate, eight rearward for takeoff assist, four mounted on the wings to stabilize them during takeoff transition, and two at the rear of the tail to prevent it from striking the ground because of over-rotation. Other STOL features included a dorsal and two ventral fins on the rear fuselage, double-slotted flaps and extended ailerons, a new radome, a tailhook for landing aboard an aircraft carrier, and Combat Talon avionics, including a TF/TA radar, a defensive countermeasures suite, and a Doppler radar/GPS tie-in to the aircraft's inertial navigation system. Of the three aircraft, only one received full modification. The program abruptly ended when one crashed during testing on October 29, 1980, and international events soon after rendered another rescue attempt moot. One of the two surviving Credible Sport airframes, 74-1686, became the YMC-130H test bed for the next generation of Combat Talons, under the project name Credible Sport II. Phase I testing, conducted between August 24 and November 11, 1981, identified design deficiencies in the airframe and determined that the Credible Sport configuration did not have the safety margins necessary for peacetime operations. Phase II testing began June 15, 1982, continued through October 1982, and determined that the final Combat Talon II configuration, with significant improvements in design, avionics, and equipment, was ready for production. The initial purchase was authorized in 1982 at 12 aircraft, even though war-fighting requirements were estimated at more than 100, but was cut from funding until 1984. In 1983 USAF Special Operations Forces were transferred to the Military Airlift Command, seen as the another move by USAF to divest itself of its special operations role. Creation of the Twenty-Third Air Force reinforced that perception further when SOF represented less than 35% of its personnel and virtually none of its headquarters staff, dominated by the "rescue community". However the moves did remove the Combat Talon program from three fighter-oriented commands to a single command where promotion cycles were more favorable. In 1983 MAC established a Special Operations Force Master Plan that called for 21 Combat Talon IIs, including two attrition backups, with Initial Operational Capability in the third quarter of 1987 and full delivery by 1991. The first Combat Talon II, 83-1212, was delivered in June 1984, but an earlier decision by USAF not to equip it with the navigational radar suite of the MC-130E slowed its development for years. In the meantime, Initiative 17, part of the "31 Initiatives" agreement between the Army and Air Force in May 1984, was deferred later that year (and eventually killed) after objections from members of Congress who saw it as a divestiture of the SOF role by the Air Force. As a result, the Air Force cut procurement of new HH-60D Nighthawk combat rescue aircraft from its budget requests, which further delayed the Combat Talon II program because, for cost control reasons, development of its "glass cockpit" and integrated avionics systems had been directly tied to that intended for the HH-60D. Five Combat Talon IIs were delivered in 1985 but the problem of acquiring a navigation radar had not been resolved (the APQ-122 was no longer being built). IBM was contracted to develop a new terrain following/avoidance radar, who then subcontracted the task to Emerson Electric Company. The resulting radar performed so poorly that the Combat Talon II was nearly cancelled, but special operations advocates in Congress kept the program alive. Ultimately the AN/APQ-170(V)8 radar was developed into a system that exceeded specifications, but at a large cost overrun and with a further three-year delay in the Combat Talon II becoming operational. Deliveries in 1987, 1988, and 1989 brought the inventory to 18 aircraft, but all were still in modification, testing, or long term storage. The first fully operational MC-130H Combat Talon II (87-0024) was received by the 8th SOS on June 29, 1991, with three others delivered over the summer. The official acceptance ceremony for the Talon II was held at Hurlburt in October, and by December 1991 the 8th SOS was equipped with six. The Combat Talon II features a stronger airframe and modifications to the rear and aft cargo doors. The electronics suite has been upgraded, and includes Global Positioning System navigation, special radars for navigating in adverse weather, and night vision goggles (NVG) capability. These new technologies allow the Combat Talon II to fly as low as 250 feet (76 m) above ground level (AGL) in inclement weather, and make faster, more accurate airdrops. Increases in automation also reduce the aircrew by two. Initial Operational capability was reached on June 30, 1993. MC-130H Reg.88-1803 at RIAT 2010. Three MC-130H Combat Talon IIs of the 7th SOS were deployed in December 1995 to deliver peacekeeping forces to Tuzla and Sarajevo, Bosnia and Herzegovina, as part of Operation Joint Endeavor, during which one Talon was hit by ground fire. The first combat deployment of a Combat Talon II was on April 8, 1996, during Operation Assured Response. Special operations forces were deployed to Liberia to assist in the evacuation of 2000 civilians from the American embassy when the country broke down into civil war. However orders to combat drop an 18-man SEAL team off Monrovia were rescinded and the mission landed in Sierra Leone. Similar circumstances brought the Combat Talon II to Zaire in 1997. Talon II deployments for joint exercises in 1997 included Australia, Guam, Indonesia, South Korea, and Thailand. In July 1997, three Talon IIs deployed to Thailand as part of Operation Bevel Edge, a proposed rescue of 1000 American citizens trapped in Phnom Penh, Cambodia, by a possible civil war, but the crisis ended when the Cambodian government allowed all non-citizens who desired so to leave by commercial air. A 7th SOS Combat Talon II aircrew, Whiskey 05, earned the Mackay Trophy for an embassy evacuation mission in the Republic of the Congo in June 1997. The crew rescued thirty Americans and twenty-six foreign nationals, and logged twenty-one hours of flight time. 550th Special Operations Squadron, three at Kirtland AFB, New Mexico. On the night of October 19–20, 2001, four Combat Talon IIs infiltrated a task force of 199 Rangers of the 3rd Battalion 75th Ranger Regiment and tactical PSYOP teams 658 miles inside Taliban-held Afghanistan. The force dropped onto Objective Rhino (30°29′12″N 064°31′32″E﻿ / ﻿30.48667°N 64.52556°E﻿ / 30.48667; 64.52556), an unused airfield in Kandahar Province 110 mi (180 km) southwest of Kandahar, to secure a landing zone as a temporary operating base for Special Forces units conducting raids in the vicinity. A month later, two MC-130Hs, flying from Masirah Island, inserted a platoon of U.S. Navy SEAL Team Three and four Humvee vehicles to within ten miles of the same airfield on the night of November 20–21. The SEAL platoon was inserted to establish an observation post at the airstrip, then assist two USAF combat controllers inserted by military free fall in preparing a landing zone for the 15th Marine Expeditionary Unit. The 15th MEU landed in CH-53 helicopters on November 25, 2001,and established Camp Rhino, the first forward operating base in Afghanistan for United States forces. Combat Talon IIs of the 7th SOS, augmented by crews from the 15th and 550th SOSs, flew 13- to 15-hour airdrop and airlanding night resupply missions from Incirlik Air Base, Turkey, to Special Forces Operational Detachments-Alpha (ODAs) in Afghanistan during the opening phase of Operation Enduring Freedom in December 2001. Operating in mountainous terrain, they innovated an airdrop tactic by replicating maximum-effort landing techniques to rapidly descend from 10,000 ft (3,000 m) to 500 ft (150 m) AGL to ensure accurate gravity drops after clearing high ridgelines into deep valleys. The 7th SOS, commanded by Lt Col Mark B. Alsid and part of the 352d Special Operations Group, received the Gallant Unit Citation in 2006 for operations conducted during Operation Iraqi Freedom between February 12 and May 12, 2003. The 7th SOS was tasked to Joint Special Operations Task Force - North, known as Task Force Viking, whose objective was to hold 13 Iraqi Army divisions along the "Green Line" in northeastern Iraq to prevent those divisions from reinforcing other Iraqi operations against United States forces invading from Kuwait. Forward-based at Constanţa, Romania, its primary mission was to infiltrate the 2nd and 3rd Battalions of the Army's 10th Special Forces Group and the 3rd Battalion of the 3rd Special Forces Group into Kurdish-held territory in preparation for Operation Northern Delay. Denied permission by Turkey to fly into Iraq from its airspace, the 7th SOS flew the first 280 troops on a circuitous path around Turkey to a base in Jordan on March 20–21, 2003. On March 22, six Combat Talon IIs (four from the 7th SOS) infiltrated 16 ODAs, four ODBs, battalion command elements, and Air Force Combat Control Teams to complete the fifteen-hour mission, the longest in U.S. Special Operations history. The insertion profile consisted of a four and one-half hour low level flight at night through western and northern Iraq to Bashur and Sulaymaniyah airfields, often taking heavy ground fire from the integrated air defenses. The Talon IIs, at emergency gross weight limits, operated blacked-out, employed chaff and electronic countermeasures, flew as low as 100 ft (30 m) AGL, and carried their troops tethered to the floor of the cargo holds. Three of the Talons were battle-damaged, with one forced to seek permission to land at Incirlik Air Base. The operation became known informally as "Operation Ugly Baby". Major Jason L. Hanover was individually honored for commanding a mission that seized two austere airstrips during the operation. After airlanding their troops, the Talon IIs then had to fly back through the alerted defenses to recover to their launching point. Overflight permission was granted by Turkey on March 23, and the Combat Talon IIs delivered a total of 50 ODAs into Iraq. The Talon IIs then resupplied Task Force Viking, assisted in operations to capture Kirkuk and Mosul, airlanded supplies at remote outposts using Internal Airlift Slingable Container Units (ISUs), and acted as pathfinders for conventional C-130 airlift missions. Twenty MC-130H Combat Talon II aircraft are operational with Air Force Special Operations Command. They will eventually be replaced by the MC-130J Commando II. MC-130P Combat Shadow, 17th Special Operations Squadron. The MC-130P series of aircraft entered service during the Vietnam War as the HC-130P SAR command and control/aerial refueling aircraft. Combat Shadows have been part of the Air Force special operations force since 1986. In February 1996, AFSOC's 28-aircraft tanker fleet was redesignated the MC-130P, aligning the variant with other M-series special operations mission aircraft. Combat Shadows provided air refueling support in Panama to Army and Air Force helicopters during Operation Just Cause. In 1990, four Combat Shadows of the 9th Special Operations Squadron deployed to King Fahd International Airport, Saudi Arabia for Desert Storm, and three of the 67th Special Operations Squadron to Batman Air Base, Turkey for Proven Force. Since the Gulf War, the MC-130P has been involved in numerous operations, including Northern Watch and Southern Watch (Iraq), Deny Flight (Yugoslavia), Restore Democracy and Uphold Democracy (Haiti), Deliberate Force and Joint Endeavor (Bosnia), Assured Response (Liberia), Guardian Retrieval (Zaire), Enduring Freedom (Afghanistan) and Iraqi Freedom. The Combat Shadow flies single or multi-ship low-level air refueling missions for special operations helicopters conducting infiltration, exfiltration, and supply missions, with command and control capability in limited situations. The primary emphasis for Combat Shadows is on night operations, using NVGs to reduce probability of visual acquisition and intercept by airborne threats. In 2008, the Air Force announced that it would replace the MC-130P fleet with a new aircraft based on the C-130J airframe. The MC-130J Commando II has the capability to complete missions faster and more efficiently than its Combat Talon and Combat Shadow counterparts. Recapitalization is a stated priority of Lt. Gen. Donald C. Wurster, commander of Air Force Special Operations Command. MC-130W Combat Spear 87-9286 at Hurlburt Field, Florida. The MC-130W Combat Spear, unofficially and facetiously nicknamed the "Combat Wombat", performs clandestine or low visibility missions into denied areas to provide aerial refueling to SOF helicopters or to air drop small SOF teams and supply bundles. The first of 12 MC-130Ws, 87-9286, was presented to Air Force Special Operations Command on June 28, 2006. The aircraft was developed to supplement the MC-130 Combat Talon and Combat Shadow forces as an interim measure after several training accidents and contingency losses in supporting the Global War on Terrorism. The program modified C-130H-2 airframes from the 1987-1990 production run, acquired from airlift units in the Air Force Reserve Command and Air National Guard. Use of the H-2 airframe allowed installation of SOF systems already configured for Combat Talons without expensive and time-consuming development that would be required of new production C-130J aircraft, reducing the flyaway cost of the Spear to $60 million per aircraft. The Combat Spears, however, do not have a Terrain Following/Terrain Avoidance capability. A standard system of special forces avionics equips the MC-130W: a fully integrated Global Positioning System and Inertial Navigation System, an AN/APN-241 Low Power Color weather/navigation radar; interior and exterior NVG-compatible lighting; advanced threat detection and automated countermeasures, including active infrared countermeasures as well as chaff and flares; upgraded communication suites, including dual satellite communications using data burst transmission to make trackback difficult; aerial refueling capability; and the ability to act as an aerial tanker for helicopters and CV-22 Osprey aircraft using Mk 32B-902E refueling pods. 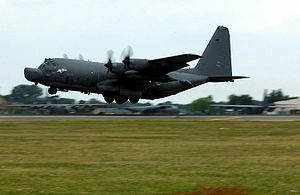 The MC-130Ws are assigned to the 73rd Special Operations Squadron at Cannon Air Force Base, New Mexico, with all twelve to be operational by 2010. Initially nicknamed the "Whiskey" (NATO phonetic for the "W" modifier), the MC-130W was officially dubbed the Combat Spear in May 2007 to honor the historical legacy of the Combat Talons in Vietnam. In May 2009, following a lapse of plans to acquire and develop an AC-27J "gunship light" to replace the aging, operations-stressed AC-130 inventory, the Air Force began exploring an option of converting MC-130Ws into interim gunships. The Dragon Spears are equipped with a Bushmaster II GAU-23/A 30mm gun (an improved version of the MK44 MOD0 30mm gun), sensors, communications systems, and precision-guided munitions in the Precision Strike Package. The PGMs are to be in the form of the Gunslinger weapons system, a launch tube designed to deploy up to ten GBU-44/B Viper Strike or Griffin (missile) small standoff munitions in quick succession. Initial supplemental funds to the 2010 Defense Authorization Bill were for two kits to be installed in 2010. On 17 November 2009, a contract was awarded to Alliant Techsystems to produce 30 mm ammunition for use by the Dragon Spear. In September 2010, the Air Force awarded L-3 Communications a $61 million contract to convert eight MC-130W Combat Spear special-mission aircraft to give them a gunship-like attack capability. Under the terms of the deal, L-3 will perform modifications that will allow the aircraft to take the weapons kits, which are called "precision strike packages". MC-130Ws fitted with the weapons will be known as Dragon Spears. Air Force Special Operations Command is converting all 12 MC-130W aircraft to Dragon Spears in order to relieve the relentless operational demands on its regular AC-130 gunships until new AC-130Js enter the fleet. The MC-130W Dragon Spear went from concept to flying with a minimum capability in less than 90 days, and from concept to deployment in 18 months. Its success led to the William J. Perry Award, and it will be the model for the AC-130J gunship program. The first converted MC-130W arrived in Afghanistan in late 2010. It fired its first weapon one month after arriving, killing five Taliban with a Hellfire missile. By September 2013, 14 aircraft had been converted into gunships. The conversion adds a sensor package consisting of day/night video cameras with magnification capability. The weapons currently consist of ten Griffin missiles and four Hellfires, with an optional 30 mm autocannon. The use of missiles allow the gunships to operate during the daytime because they can fly above the range of ground fire. The cannon is available but optional, as missiles provide sufficient firepower and less weight would need to be carried. The MC-130J sits on the tarmac after its unveiling. Beginning in 1997, studies of the vulnerability of the non-stealthy MC-130 force reflected concerns about its viability in modern high-threat environments, including the prevalence of man-portable air-defense systems ("MANPADs") in asymmetric conflicts. At least two studies were conducted or proposed to explore the prospect of a replacement aircraft (known variously as "MC-X" or "M-X"), with USAF at that time hoping for an Initial Operating Capability date of 2018. One analyst questioned the survivability of slow non-stealthy platforms such as the MC-130 in future threat environments in a 2007 presentation to the Center for Strategic and International Studies, and stated his opinion that development of a stealthy replacement for the MC-130 is a "strategic priority". The U.S. Department of Defense's 2006 Quadrennial Defense Review Report also recognized the concern, asserting DoD's intention to "enhance capabilities to support SOF insertion and extraction into denied areas from strategic distances." Despite these concerns, the USAF decided to proceed with modernization of the current force. The Air Force has stated it desires 37 MC-130Js to replace its MC-130Es and MC-130Ps, which are 40 or more years old. Based on the KC-130J tanker operated by the United States Marines Corps, the new MC-130J has added features for both combat search and rescue and special operations missions. The HC-130J and MC-130J both use the KC-130J tanker as a baseline, but with major modifications to the Block 6.5 KC-130J. The MC-130J adds an Enhanced Service Life Wing, an Enhanced Cargo Handling System, a Universal Aerial Refueling Receptacle Slipway Installation (UARRSI) boom refueling receptacle, more powerful electrical generators, an electro-optical/infrared sensor, a combat systems operator station on the flight deck, provisions for the Large Aircraft Infrared Countermeasures System, and armor. Production of the first MC-130J aircraft was started at Lockheed Martin’s facility in Marietta, Georgia, on October 5, 2009. Lockheed Martin will build an MC-130J tanker version for Air Force Special Operations Command on its standard C-130J production line. The MC-130J is the first C-130 specifically built for special operations, making it lighter and more efficient. Most special operations aircraft are modified after production to accommodate special operations missions. The MC-130J was initially dubbed the Combat Shadow II in honor of the aging MC-130P platform that it was expected to replace, however, it was recently officially named the Commando II. The Air Force Special Operations Training Center has begun the MC-130J training program in conjunction with the 193rd Special Operations Wing, using any of the unit's four EC-130J Commando Solo aircraft to form what will become the training regimen for MC-130J aircrew members. The MC-130J has a 5-member crew, a major reduction in size from the standard 8-member MC-130P Combat Shadow crew, thus requiring additional coordination among crew members. The MC-130J will begin replacing aging MC-130E Combat Talon I and MC-130P Combat Shadow aircraft after a period of testing and evaluation. The Commando II will fly clandestine, low-level aerial refueling missions as well as infiltration, exfiltration and resupply missions. Eventually the 415th Special Operations Squadron, a unit of the 58th Operations Group, will become the main training unit for both MC-130J & HC-130J operations. The 522nd Special Operations Squadron is the first to operate the MC-130J Commando II. It is expected to achieve Initial Operational Capability in 2012. The first MC-130J (09-6207) undertook its first test flight on 22 April 2011. The 522nd Special Operations Squadron received its first MC-130J in late September, 2011. A total of 37 MC-130J aircraft are planned, which will eventually replace all other MC-130 variants. Two of the four aircraft assigned to Project Stray Goose were lost in combat: 64-0563 was destroyed on November 25, 1967, by a direct hit of a mortar round while parked on the Nha Trang flightline. The aircraft had been scheduled for a mission and had just completed preflight of the exterior when the mission was cancelled. Soon after the crew left the ramp, the aircraft was hit and destroyed by fire. 64-0547 was missing-in-action with its entire 11-man crew on December 29, 1967, on a mission to drop leaflets inside North Vietnam. The Blackbird had completed its leaflet drop leg of the mission at 30,000 ft (9,100 m) and begun its descent to its terrain-following exit altitude. Communication was lost without the Blackbird reporting any threats detected. SOF commanders at the time discounted the possibility of its being shot down because the flight, conducted by an inexperienced aircraft commander under new moon conditions, was not claimed as such by North Vietnam. In November 1992 the wreckage was located near the peak of a mountain 32 mi (51 km) northeast of Dien Bien Phu, and it was surmised that its descent was too steep for its TF/TA radar to stabilize. 64-0547 was the only special operations MC-130 lost on a combat mission over hostile terrain in the history of the program. 64-0558 was lost in a mid-air collision during a night training exercise 15 miles north of Conway, South Carolina on December 5, 1972. An F-102 Delta Dagger of the South Carolina Air National Guard, attempting a night intercept of the Talon, flew into the fuel drop tank on the its right wing, with the loss of both aircraft, killing all 12 aboard the C-130. 64-0558 had been one of the two Talons assigned to the Son Tay POW camp rescue mission. Former Heavy Chain and Desert One veteran 64-0564 crashed into the ocean shortly after a pre-dawn takeoff from NAS Cubi Point, Philippines, on February 26, 1981, killing 15 passengers and eight of nine crewmen. The Talon was taking part in Special Warfare Exercise 81 and had flown 12 missions in the preceding 16 days. Following an administrative flight the day before, the crew was scheduled for its last mission, a night exercise that was set back from 01:00 local time to 04:30. The flight profile consisted of a normal takeoff, a tactical landing a half hour later to onload 15 Navy SEALs, followed by a tactical takeoff. The Talon reported normal flight conditions six minutes after the tactical takeoff, but crashed nine minutes later. No cause was determined, but investigators found that the likely causes were either crew fatigue from operations tempo, or failure of the terrain following radar to enter "override" mode while over water. Combat Shadow 66-0213 was lost when it flew into the ground in eastern Afghanistan on February 13, 2002. Assigned to the 9th SOS, the aircraft made an emergency climb in poor visibility to avoid a hill but crash landed wheels up in deep snow. The aircraft was a total loss but the crew of eight survived. Combat Talon II 84-0475, assigned to the 15th SOS, was lost in a takeoff crash on June 12, 2002, near Gardez, Afghanistan. During a night exfiltration mission of two Special Forces soldiers from a landing strip at the Sardeh Band dam, the Talon crashed less than three miles from the airstrip shortly after takeoff. Conflicting reports point to overweight cargo and windshear as possible causes. The Talon's two loadmasters and a passenger were killed. Combat Talon II 90-0161, also of the 15th SOS, crashed into Monte Perucho, south of Caguas, Puerto Rico, during a training mission on August 7, 2002, killing all ten aboard. The Talon was flying a terrain following night mission in blowing rain and fog, along a low level route commonly used by the Puerto Rico Air National Guard. The crew misinterpreted and disregarded terrain obstacle warnings. Combat Talon II 85-0012 was severely damaged during a landing accident at Mosul, Iraq, on December 29, 2004. The 15th SOS aircraft was on a resupply mission and struck a trench dug into the runway while still at 80 knots, shearing off part of its landing gear and partially separating its left wing from the fuselage. The trench was part of a U.S. Army construction project and a warning Notice To Airmen (NOTAM) had not been filed or disseminated to the aircrew, despite a safety hazard report filed in the week previous by another aircrew. No fatalities occurred but the aircraft was destroyed by explosive demolition to prevent its classified equipment from being compromised. A Combat Talon II of the 7th SOS, 87-0127 (Wrath 11), crashed during a terrain-following-and-avoidance night training exercise on March 31, 2005, near Rovie, in the Drizez Mountains in southeast Albania, 60 miles southeast of Tirana. The Talon had taken off from Tirana-Rinas Airport 20 minutes before and was one of two flying at 300 ft (91 m) AGL at a reduced power setting. The aircraft was lost when it stalled attempting to clear terrain, killing all nine crew members. ↑ "Gallery of USAF Weapons". May 2008. , p. 148. ↑ 2.0 2.1 2.2 2.3 Thigpen (2001), p. 461. ↑ 3.0 3.1 "Gallery of USAF Weapons". May 2008. , p. 145. ↑ "ARINC Flightsafety on U.S. Air Force Combat Spear Trainer". Training & Simulation Journal. http://www.tsjonline.com/story.php?F=3866026. Retrieved 8 March 2009. ↑ 5.0 5.1 5.2 5.3 5.4 5.5 "MC-130E/H Combat Talon fact sheet". Air Force Link. Archived from the original on 12 December 2012. http://archive.is/HktM. Retrieved 10 June 2009. ↑ 6.0 6.1 "Fact sheet MC-130W Combat Spear". Air Force Link. Archived from the original on 16 July 2012. http://archive.is/qYx9. Retrieved 10 June 2009. ↑ "First HC/MC-130J Assembled", AIR FORCE Magazine December 2009. Air Force Association. Retrieved 4 December 2009. ↑ 9.0 9.1 9.2 Thigpen, Col. Jerry L. (2001). The Praetorian STARShip: The Untold Story of the Combat Talon, Air University Press/Diane Publishing. ISBN 1-58566-103-1, p. 19. Thigpen commanded the 8th SOS during Operation Just Cause and spent more than 10 years in the Combat Talon program. ↑ 10.0 10.1 10.2 10.3 10.4 10.5 Thigpen (2001), p. 20. ↑ Olausson, Lars, Lockheed Hercules Production List - 1954-2008 - 25th ed., Såtenäs, Sweden, April 2007. Self-published. No ISBN. ↑ Mueller, Robert, Air Force Bases Volume I - Active Air Force Bases Within the United States of America on 17 September 1982; Office of Air Force History, United States Air Force, Washington, D.C., 1989, page 447. ISBN 0-912799-53-6. ↑ 13.0 13.1 Thigpen (2001), p. 58. The Blackbird nickname lasted until the 1980s, when Dupont stopped manufacturing the paint. ↑ Thigpen (2001), p. 88. ↑ Thigpen (2001), pp. 261-262, Appendix A, p. 469. The Special Forces soldier suffered a punctured lung and broken hip in the short fall, but died of complications from a tracheotomy during medical evacuation. ↑ Thigpen (2001), p. 304. So-called because its objective was to develop a capability of extracting four to six troops in a single pass. ↑ Thigpen (2001), p. 38. ↑ 18.0 18.1 18.2 Thigpen (2001), p. 21. The 12 original C-130E(I) "Clamps" were 64-0523, -0547, -0551, -0555, -0558, -0559, -0561, -0562, -0563, -0566, -0567, and -0568. ↑ "MC-130E Combat Talon I". GlobalSecurity.org. http://www.globalsecurity.org/military/systems/aircraft/mc-130e.htm. Retrieved 2006-12-10. ↑ Thigpen (2001), p. 66. ↑ Thigpen (2001), p. 70. The "Swap" Talons were originally Rivet Clamp modifications without the Fulton STARS apparatus. ↑ Thigpen (2001), p. 168. ↑ Thigpen (2001), P. 396. ↑ Thigpen (2001), p. 237. ↑ Thigpen (2001), p. 473, lists all the changes. Other notable major upgrades were engine upgrade to Allison T56-A-15, new center wing boxes, installation of flare/chaff dispensers, infrared defensive pods, new FLIR, low gloss two-shade gray paint, the Universal Aerial Refueling Receptacle/Slipway, and Benson tanks for all aircraft. ↑ Thigpen (2001(, pp. 49 and 56. ↑ Thigpen (2001), pp. 77-78. ↑ Thigpen (2001), pp. 84-85. Sell was co-pilot of 64-0563 when it flew the first resupply mission into North Vietnam on January 17, 1967, to support a SOG Road Watch team, for which the entire SG-05 crew received the Distinguished Flying Cross. ↑ Schanz, Marc (December 2009). "Vietnam War Unit Honored". pp. 19. ↑ Thigpen (2001), pp. 82-83. ↑ Thigpen (2001), p. 139. ↑ Thigpen (2001), p. 67. By tradition, the Talon base within the continental United States, because of its training responsibilities, is referred to as "the schoolhouse," a nickname first passed to Hurlburt Field, then to Kirtland Air Force Base when the 550th SOS began operations. ↑ Thigpen (2001), p. 111. The 90th had been an A-37 Dragonfly attack squadron, and when the A-37's were turned over to the Vietnamese Air Force, its designation was transferred to preserve its long heritage. ↑ Thigpen (2001), p. 114. The following Talons served in Southeast Asia at some point between 1966 and 1972: 64-0523, -0547 (lost), -0551, -0555, -0558, -0561, -0562, -0563 (lost), -0567, and -0568. ↑ Thigpen (2001), p. 143. The Talon was already at LAS Ontario for previously-scheduled modifications when it was sourced to the rescue operation. ↑ Gargus, John (2007), The Son Tay Raid: American POWs in Vietnam Were Not Forgotten, Texas A&M Press. ISBN 1-58544-622-X, p. 58. Gargus was radar navigator on Cherry 02 and a mission planner. ↑ Gargus (2007), pp. 63-64. ↑ Thigpen (2001), pp. 139-157. ↑ Thigpen (2001), p. 160. ↑ Grandolini, Albert. "Cambodia 1954-1999; Part 2". ACIG.org. http://www.acig.info/CMS/index.php?option=com_content&task=view&id=234&Itemid=47. Retrieved 6 February 2013. ↑ Koskinas (2006), p. 103. ↑ 43.0 43.1 Thigpen (2001), p. 184. ↑ Thigpen (2001), p. 182. ↑ Thigpen (2001), p. 184. 62-1843, 63-7785, 64-0564, and 64-0565 of the 1st SOS, and 64-0562, 64-0567, and 64-0572 of the 8th SOS. In-flight refueling of helicopters was rejected as an option because the HC-130s available to refuel them had no IFR capability themselves. ↑ Thigpen (2001), pp. 194-207. Electing to use EC-130s to ground refuel the helicopters instead of air-dropping blivets was not formally approved until April. The method was favored by ground commander Col Charles Beckwith, however, and so had been successfully rehearsed many times. Preparatory work to lay out the Desert One airstrip, acquire the EC-130s, and stage essential materiel to Egypt had preceded the formal approval of Eagle Claw's final form by weeks. Talons played the role of the three EC-130s in the full-scale rehearsal. The Holloway Commission criticized the task force for failing to conduct such a rehearsal, but since it did in fact occur, the commission may have been contending that another or multiple independently assessed "dress" rehearsals was desirable after the final form was approved by the JCS on April 16, in hopes that the command and control difficulties would have been uncovered. With a May 1 deadline because of a decreasing number of hours of darkness, there was no time to lay on further "dress rehearsals", and all of the elements used on April 24 were in fact successfully executed March 25–26. The entire training process was a five-month evolution of the two-night concept, employing techniques never before tried that had to be perfected before they could be rehearsed with other components. The ad hoc nature of this process, with its components scattered at various sites, failed to build a team mentality, and it was this failure that the Holloway Commission targeted. ↑ Thigpen (2007), pp. 213-215. Of the eight crews assigned, five were from 8th SOS and three from 1st SOS. The extra 1st SOS Talon and its crew were both a spare and the primary aircraft for Elbow Rub, an alternative, highly classified project to heavily damage Iran's power grid had it been ordered as a retaliatory mission for harming the hostages (Thigpen, p. 203). ↑ Thigpen (2001), p. 196. ↑ Thigpen (2001), p. 213. The aircraft were obtained without crews and without their communications capsules from the 42nd Airborne Command and Control Squadron at Keesler Air Force Base, Mississippi, the first on March 15, 1980, and the other two on April 14. ↑ Thigpen (2001), p. 211. The seventh primary crew, including author Thigpen, waited at Wadi Qena to lead the Night Two phase. The three crews would have been those of the lead Talon (Dragon 1), and two of the EC-130s, Republic 4 and Republic 6. Most of the crew of Republic 4 died at Desert One. ↑ 1st SOS aircraft involved were 63-7785, 64-0564, and 64-0565. ↑ Thigpen (2001), p. 228. ↑ Thigpen (2001), p. 177. The MC-130Es were 64-0562, -0572, -0568, -0567, and -0551. ↑ Thigpen (2001), p. 276. ↑ Thigpen (2001), pp. 281-282. ↑ Thigpen (2001), p. 282. ↑ Thigpen (2001), pp. 181-186. ↑ 59.0 59.1 Thigpen (2001), p. 296. ↑ Thigpen (2001), pp. 323-330. ↑ Thigpen (2001), p. 335. Maj. David L. "Skip" Davenport was awarded the DFC at Rio Hato, and also flew Noriega to the United States. ↑ Thigpen (2001), p. 345. 64-0559, -0562, -0567, and -0568. ↑ Thigpen (2001), pp. 264-265. ↑ Thigpen (2001), p. 361. After the war it was found that both F-15E crewmen had died in the crash. ↑ Thigpen (2001), p. 408. ↑ Thigpen (2001), p. 452. Prior to this, all associate units were Air Force Reserve organizations assigned to active force wings. ↑ Schanz, Marc (November 2006). "Air Force World". , p. 18. ↑ King, TSgt Samuel (2013). "Air Force Combat Talons fly for last time". 919 SOW. http://www.919sow.afrc.af.mil/news/story.asp?id=123344937. Retrieved 2013-06-20. ↑ Thigpen (2001), p. 241. C-130Hs used in Credible Sport were 74-1683, -1686, and -2065. ↑ Thigpen (2001), pp. 241-244, includes photographs of all the external features. ↑ Thigpen (2001), p. 245-246. ↑ Thigpen (2001), p. 291. ↑ Koskinas (2006), p. 123-124, points out that MAC had been forced to virtually combine ARRS and 23AF headquarters because of funding shortages for authorized staff billets, and asserts it was unable to draw on SOF personnel because it had committed itself to TAC to maintain a separate identity for SOF units. ↑ Thigpen (2001), p. 292. ↑ Thigpen (2001), p. 293. ↑ Koskinas (2006), pp. 138 and 160. The 31 initiatives were a Memorandum of Agreement that identified 31 ways in three areas--eliminating duplication of effort or merging similar programs, roles and missions, and joint action or cooperation--that would integrate the efforts of both services in the "AirLand Battle" doctrine for fighting the Warsaw Pact. ↑ Thigpen (2001), p. 294. Initiative 17 would have transferred the entire rotary wing SOF effort over to the Army. ↑ Thigpen (2001), p. 300. The 1985 deliveries were 84-0475, 84-0576, 85-0011, 85-0012, and 86-1699. ↑ Thigpen (2001), p. 309. Delivered were 87-0023, -0024, -0125, -0126, and -0127. ↑ Thigpen (2001), p. 312. delivered in 1988 were 88-0191, -0192, -0193, -0194, and -0264. ↑ Thigpen (2001), p. 314. Delivered in 1989 were 88-0195 and 88-1803. ↑ Thigpen (2001), p. 316. ↑ Thigpen (2001), p. 378. ↑ Thigpen (2001), p. 390. ↑ Thigpen (2001), pp. 414 and 419. ↑ Thigpen (2001), p. 420. ↑ Thigpen (2001), p. 429. ↑ Schilter-Lowe, Merrie (May 27, 1998). "Combat Talon II crew receives Mackay Trophy". Air Force Special Operations Command Public Affairs. Air Force News Service. http://www.fas.org/irp/news/1998/05/n19980527_980729.html. Retrieved 2006-12-10. ↑ Airframes 83-1212, 84-0475, 85-0011 and 0012, 87-0024, 89-0280, -0281, 0282, and 0283, 90-0161 and 0162. ↑ Airframes 88-0191, -0192, -0195, -0264, and -1803. ↑ Airframes 84-0476, 86-1699, 87-0023, 88-0193, and 88-0194. ↑ Airframes 87-0125, -0126, and -0127, used for crew training. ↑ Stewart, Dr. Richard W. (2003). "The United States Army in Afghanistan: Operation Enduring Freedom". United States Army Center of Military History. http://www.history.army.mil/brochures/Afghanistan/Operation%20Enduring%20Freedom.htm#p14a. Retrieved 4 December 2009. ↑ Bahmanyar, Mir, and Osman, Chris (2008). SEALs: The U.S. Navy's Elite Fighting Force. Osprey, ISBN 978-1-84603-226-4, pp. 110-111. ↑ McCool, John (2005). Interview with Major David Diehl, USAF, Operational Leadership in the Global War on Terrorism. Combat Studies Institute, Ft. Leavenworth, Kansas. Diehl was a crew commander detached from the 550th SOS to the 7th SOS. ↑ The task assigned to the 5,200-man JSOTF-N was originally that of the entire reinforced 4th Infantry Division, denied the use of Turkey as a jumping off point. ↑ 101.0 101.1 Briscoe, Capt. Charles H. (2006). All Roads Lead to Baghdad: Army Special Operations Forces in Iraq. USASOC History Office, Department of the Army. pp. 117. ISBN 978-0-16-075364-0. ↑ 102.0 102.1 Linda Robinson (2004). "Viking Hammer (And The Ugly Baby)". Masters of Chaos: The Secret History of the Special Forces. PublicAffairs. pp. 297–298. ISBN 1-58648-352-8. ↑ 103.0 103.1 103.2 103.3 McCool, John (2005). Interview with Major David Harris, USAF, Operational Leadership in the Global War on Terrorism. Combat Studies Institute, Ft. Leavenworth, Kansas. Briscoe and Robinson attribute the term "Ugly Baby" to a quip by a Special Forces trooper after seeing the flight path from Romania. However Harris, a radar navigator on one of the aircraft, states that the Talon II electronic warfare officer mission planner coined the term for the infiltration route inside Iraq after analyzing the Iraqi air defenses. ↑ Per Harris, the Talons, penetrating Iraq in single file, encountered four engagements before reaching Tel Afar, then had to transit a known area of dense air defenses referred to as "SAM Alley", where battle damage was incurred. ↑ Known as the "Sealy configuration", the technique was developed during Eagle Claw and became standard. ↑ Jabara award honors aviator’s contributions(this statement is not true, I was there, LtCol Dean was the mission commander of this mission), Inside AF.mil, April 28, 2004. ↑ 107.0 107.1 107.2 "USAF MC-130P Combat Shadow Factsheet". Air Force Link. United States Air Force. June 2009. Archived from the original on 2012-07-17. http://archive.is/Egfj. Retrieved 2009-06-10. ↑ "Gallery of USAF Weapons". May 2008. , p. 145. USAF continues to field 33 HC-130P/HC-130N dedicated CSAR aircraft as part of Air Combat Command. ↑ "Gallery of USAF Weapons". May 2008. , p. 145-146. ↑ "Fact sheet MC-130W Combat Spear". Air Force Link. Archived from the original on 16 July 2012. http://archive.is/qYx9. Retrieved 8 March 2009. The MC-130Ws are 87-9286 and 9288, 88-1301 through 1308, 88-1051 and 1057. ↑ Hebert, Adam (March 2007). "Tough Test For Secret Warriors". , p. 38. ↑ "$14.1M to Train MC-130P Combat Spear Aircrew". Defense Industry Daily. http://www.defenseindustrydaily.com/141M-to-Train-MC-130P-Combat-Spear-Aircrew-05004/. Retrieved 8 March 2009. ↑ Schanz, Marc (March 2008). "Special Operators Head West". , p. 32. ↑ "MC-130P takes historical name". Air Force Times. http://www.airforcetimes.com/news/2007/05/airforce_mc130w_combatspear_070515/. Retrieved 8 March 2009. ↑ LaGrone, Sam. "AFSOC fills gunship gap with C-130s". Air Force Times, 14 May 2009. Retrieved 2 October 2009. ↑ "Socom Refines AC-130J Gunship Plans". Aviation Week. http://www.aviationweek.com/aw/generic/story_generic.jsp?channel=defense&id=news/awst/2010/03/22/AW_03_22_2010_p30-213277.xml&headline=Socom%20Refines%20AC-130J%20Gunship%20Plans. ↑ Hambling, David. "Spec Ops Shops for 10-pack of precision guided bombs". WIRED, 25 June 2009. Retrieved 2 October 2009. ↑ Reed, John. Inside The Air Force, 17 July 2009. Retrieved 2 October 2009. ↑ Maze, Rick. "Panel adds $308 million to spec ops budget" Navy Times, 11 June 2009. Retrieved 2 October 2009. ↑ "ATK Wins $20 Million Ammunition Contract". Trading Markets.com. Retrieved 4 December 2009. ↑ "MC-X Commando Spirit SOF Future Aircraft", GlobalSecurity.org. Accessed 15 December 2009. ↑ US Air Force defines future stealth transport, Jane's.com. Accessed 15 December 2009. ↑ "Stealthy Mobility & Support Aircraft for US Special Operations Forces", by Robert C. Martinage. CSBA online. Accessed 15 December 2009. Martinage, then a fellow with the Center for Strategic and Budgetary Assessment think-tank, went to become a Deputy Assistant Secretary of Defense for SOF/low intensity conflict operations. ↑ "2006 Quadrennial Defense Review report". U.S. department of Defense. http://www.defense.gov/qdr/report/Report20060203.pdf. Retrieved 15 December 2009. , p. 45. ↑ "New C-130J Model in Spotlight"
↑ "Factsheet MC-130J Combat Shadow II". U.S. Air Force Special Operations Command, Public Affairs Office. 17. Archived from the original on 12 December 2012. http://archive.is/TXGs. Retrieved 14 January 2012. ↑ "EC-130J Commando Solo Fact Sheet". U.S. Air Force Special Operations Command. Archived from the original on 20 July 2012. http://archive.is/nIsW. Retrieved 11 February 2012. ↑ Arroyo, Rachel (2). "First MC-130J Training Program Takes Flight". Air Force Special Operations Command, Public Affairs Office. Archived from the original on 12 December 2012. http://archive.is/VV5F. Retrieved 14 January 2012. ↑ Thigpen (2001), p. 89. ↑ Thigpen (2001), p. 90-101. ↑ Thigpen (2001), p. 70. The F-102 was 56-1517 of the SCANG's 157th Fighter Interceptor Squadron. ↑ Thigpen (2001), pp. 248-249. "Override" shuts down the terrain-following mode when the system fails to receive return signals because of a water surface, enabling normal low altitude warnings to give alarms. ↑ "C-130 loss 13 Feb 2002". Air Safety Network. http://aviation-safety.net/database/record.php?id=20020213-0. Retrieved 9 March 2009. ↑ "USAF Aircraft Serials 1966". Joe Baugher. http://home.att.net/~jbaugher/1966.html. Retrieved 9 March 2009. ↑ "C-130 loss 12 Jun 2002". Air Safety Network. http://aviation-safety.net/database/record.php?id=20020612-0. Retrieved 9 March 2009. ↑ Arlington National Cemetery Website: Anissa Ann Shero One of the loadmasters, SSgt Anissa A. (Shuttleworth) Shero, was the first female Talon crew fatality, and the first USAF woman to be killed in Afghanistan. ↑ "C-130 loss 7 Aug 2002". Air Safety Network. http://aviation-safety.net/database/record.php?id=20020807-0. Retrieved 9 March 2009. ↑ "C-130 loss 29 Dec 2004". Air Safety Network. http://aviation-safety.net/database/record.php?id=20041229-0. Retrieved 9 March 2009. ↑ "C-130 loss 31 Mar 2005". Air Safety Network. http://aviation-safety.net/database/record.php?id=20050331-0. Retrieved 9 March 2009. Wikimedia Commons has media related to C-130 Hercules special operations variants.